Patrick Testin is the member-elect of the Wisconsin State Senate for District 24 after defeating incumbent Julie Lassa in the Nov. 8 election. Testin’s plan for state education reform, the Wisconsin Education Achievement Initiative, proposes to limit the number of general education requirements, change the “staff dynamics” in the UW System, link tuition increases to the Consumer Price Index, increase competition through better education and offer refinancing options to fiscally responsible students. The average student earns an undergraduate degree in six years that costs upwards of $150,000. This hefty price tag exceeds the annual household income for an average family. We divided this claim into three separate parts, starting with the time it takes to complete an undergraduate degree in the UW System. Testin sites this claim from a 2013 PolitiFact article fact-checking Ron Johnson’s claim that the average student graduates college in six years. The National Center for Education Statistics is the federal entity within the U.S. Department of Education and the Institute of Education Sciences that analyzes education data. According to an NCES factsheet which was also used in the above PolitiFact article, “44 percent of 2007–08 first-time bachelor’s degree recipients completed a bachelor’s degree within 48 months of their initial postsecondary enrollment, another 23 percent within 49–60 months, and an additional 9 percent within 61–72 months.” So, that means 48 percent of people are finishing their degrees within four years, 23 percent between four and five years and 9 percent are taking just over five to six years to finish their degrees. This is national data, however. Looking at UW System data shows a slightly different picture. 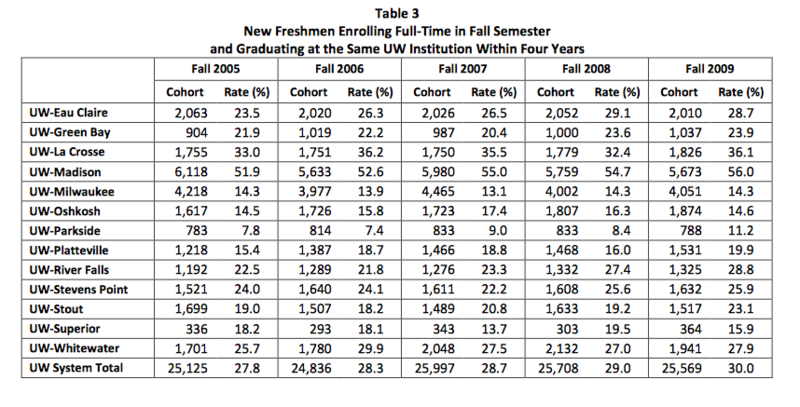 Graduation rates and times vary across the UW System schools. According to a study by College Board, 50 percent of students graduate within four years at UW-Madison, while only 9 percent do so at UW-Parkside. It is difficult to define an average graduation time for UW System students, because the average rates at each school vary heavily depending on the individual institution. According to the UW System’s report, Retention and Graduation: 2013-2014, 30 percent of Wisconsin students who start and end their academic career at the same institution graduate in four years. This is the highest rate ever recorded. The chart below breaks it down by each institution. While 65 percent of students graduate within six years, this figure also includes those who graduate early, on time or anything below six years. The second part of Testin’s claim is that the degree costs upwards of $150,000. Tuition costs in Wisconsin vary heavily depending on the institution. The highest public tuition rates are at the University of Wisconsin-Madison, at $10,489 for Wisconsin residents. Taking the most expensive option, while tuition alone would not add up to $150,000, the additional expenses of college add up, as illustrated below. UW-Madison has the highest tuition rates of any state school in Wisconsin and is located in a city with high living costs compared to other cities within the state. If a student were to graduate in six years with the above costs, that would come out to just over $150,000. However, this number would be the most expensive case. The third part of Testin’s claim is addressing household income. The average annual household income varies only slightly depending on location. The national and Wisconsin average household incomes are both right around $55,000. These figures would definitely fall into place with Testin’s claim. 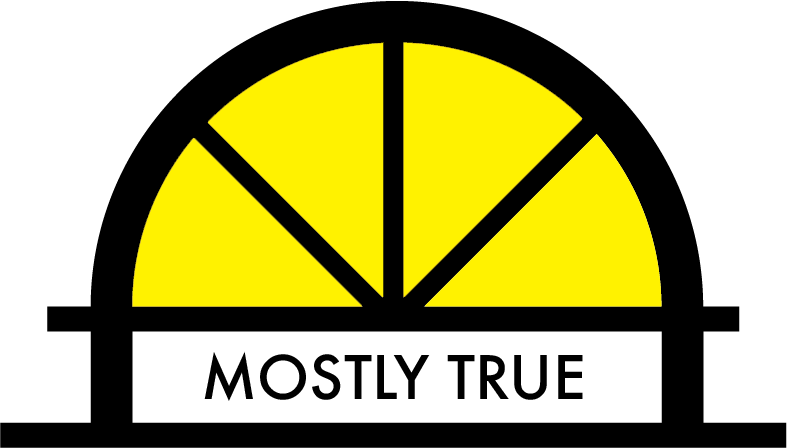 The Observatory rates Testin’s claim as mostly true. While the numbers Testin used were accurate, he was relying on a statement made about college students nationally, despite the fact that he was focusing on education reform within Wisconsin. Additionally, the $150,000 figure is at the high end for the amount of debt that students would carry upon graduation. But he was correct that debt can easily exceed the average household income for Wisconsin residents.